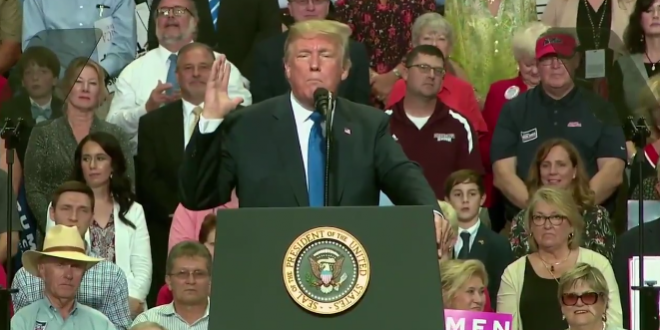 Trump Ridicules Christine Blasey Ford At Rally [VIDEO] - Joe.My.God. President Trump mocked and imitated Dr. Christine Blasey Ford at a rally in Mississippi on Tuesday night, questioning the credibility of the testimony she gave to the Senate Judiciary Committee last Thursday. “‘I had one beer.’ Well do you think it was … ” he said, playing both Ford and her questioner. “‘Nope. It was one beer.’ Oh good. How did you get home? ‘I don’t remember.’ How did you get there? ‘I don’t remember.’ Where is the place? ‘I don’t remember.’ How many years ago was it? ‘I don’t know. I don’t know. I don’t know.’” At this point the crowd went wild. It’s worked so well, why quit now?